SOA Virtual Machine (SOA-VM) is a virtual platform for deployment, distributed execution, and analysis of business processes. It can be used as both an in-house and cloud computing BPM platform. SOA-VM directly executes processes modeled in SOA Information Model (SOA-IM), a business process ontology created by Semantion. A detailed snapshot of a process is available at any point in time during and after the process execution. On the other hand, the process updates can be done in real-time without any code changes. Semantion SOA-VM is a component-based service oriented pluggable architectural platform. SOA-VM is based on Semantion SOA Information Model (SOA-IM) and SOA Collaboration Semantics (SOA-CS) specifications. SOA-IM enables full definition and modeling of all business process entities. The output of a business process model is the Collaborative Process Information Document (CPID), an XML document that contains all SOA-IM entities needed to deploy and execute the process. SOA-CS enables integration of all SOA-VM architectural components. SOA-VM interprets CPID and with universal process semantics (SOA-CS) embedded in its components, enables process deployment and execution. Semantion SOA-VM provides a unique no-coding business process support. It can virtually execute any process without coding. SOA-VM is 100% J2EE Java-based platform. Semantion Federation Server is a component of the Semantion SOA Virtual Machine (SOA-VM). communicates with Gateway, Portal and Collaborative Process Flow Controller. communicates with and provides necessary information for the Process Flow Manager. Semantion Registry and Repository 3.3 stores, version-controls, queries and maintains collaborative meta-data and content that include metamodels, collaborative participants (federates) profiles, gateway profile, security profiles, business process specifications, collaborative documents, business artifacts and web services information. Each collaborative process executed in the Semantion SOA Virtual Machine (SOA-VM) is a set of collaborative process flows and other collaborative entities that provide support for modeling of collaborative processes. Process Flow Manager manages collaborative process flows. A collaborative process flow is a set of correlated events, activities and decisions that represent collaborations between roles. In FERA-based SOA, an activity or a decision can be performed by: a web service or an agent or a person or a person using a system with inputs received from the SOA Federation. The Process Flow Manager manages collaborative process flows and availability of inputs, outputs, criteria and choices for collaborative processes activities and decisions. For example, as soon as a reference to an input becomes available, the Process Flow Manager will retrieve all activities, decisions and events which the input is related to. Based on that information, the Process Flow Manager will send a message to the Activity Manager, or the Decisions Manager, or the Event Manager to start the activity or decision or fire the event associated trigger. Event Manager manages events. An event is a collaborative element that represents that something happens during the CP flow. Each event has a trigger that creates the event and one or more actions that are the consequences of the event. Events can be organized into clusters or combined to form compound events. They progress through stages in the life cycle whereby each stage change has a meaning to the participants. Events can take place in the SOA Federation context or in the systems that are federated. Other collaborative elements (e.g., users, agents, systems) can subscribe to or publish events. Event Manager creates event instances when trigger conditions are met and controls the stages of events based on their trigger and action confirmation availability. 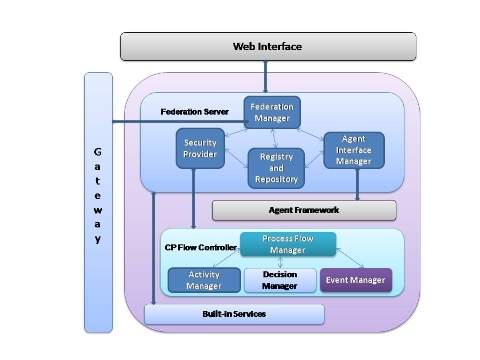 An activity is a task or an operation performed by either a SOA federate or a local SOA Federation agent. Activity Manager manages execution of activities communicating with the Process Flow Manager and Registry and Repositoy. When all required inputs for an activity become available, the Process Flow Manager notifies the Activity Manager. The Activity Manager manages the execution of the activity based on the activity related information in the Registry. The activity execution generates outputs that become inputs for another activity or criteria for a decision. Activity Manager also updates metrics if an activity generates metric information. A metric contains a quantifiable value that belongs to a specific argument that can be referenced in business rules that are used to dynamically control collaborative process flow during the collaborative process execution. Metrics are also used to measure collaborative processes and generate their patterns. Similar to an activity, a decision is made by either a SOA federate or a local SOA Federation agent. Decision Manager manages executions of decisions communicating with the Process Flow Manager and Registry and Repository. When all required criteria for a decision become available, Process Flow Manager notifies Decision Manager. Decision Manager manages the execution of the decision based on the decision related information in Registry.and Repository. When a decision is made, a choice is generated and it becomes an input for another activity or a criterion for another decision. Decision Manager also updates metrics if a decision generates metric information.